This uninhabited and incredibly picturesque island in the remote and magnificent Raja Ampat archipelago has acquired a mythical reputation. My first view of the Bird’s Head Peninsula of West Papua was at dawn. From the aircraft’s window, long slanting rays of morning sunlight reflected off puffs of mist rising from the dense forests below. The aircraft was silent and as it angled gently, the calm sea shimmered like a vast sheet of gold. Two hours away by ferry from the Bird’s Head Peninsula was Raja Ampat, ranked among the world’s top scuba-diving destinations, a hot spot with dense concentrations of marine bio-diversity and relatively undesecrated by the heavy hand of humankind. Ancient rock forms hundreds of islands from which shaggy forests explode, the sea pounding their bases into undercut cliffs. But there are also calm bays where the sea laps in transparent sheets against soft white beaches, backing up into dense rainforests with spectacular waterfalls and ancient burial sites, and where birds-of-paradise and coconut crabs flourish, for the fauna of the region is Australasian, being east of the Wallace Line that separates the ecozones of Asia and Australia. The four main islands in Raja Ampat are Waigeo, Misool, Salawati and Batanta. Thinly populated, largely unexplored, this part of the world is a primitive paradise. Beneath the surface of the sea is incredible marine wealth, where a complex and stunning ecosystem thrives with shoals of colourful fish, minute sea creatures specialised to survive only in a particular niche, unlikely creatures such as the wobbegong shark, splendidly alien manta rays and coral gardens so rich as to defy description. Scuba divers from all over the world endure long flights and basic infrastructure to experience this — nature at its primal best — while non-scuba divers get to live their dreams — abandonment on isolated tropical beaches, dense forests, cornflower blue skies and a sea so clear and rich with coral and colourful fish that it seems surreal. There is a tension between increased tourism and the economic benefits it confers, and the preservation of the very thing visitors have come to experience — the splendid isolation and spectacular beauty of nature, untouched, untrammelled, undeveloped, for more visitors means more motor boats, noise, pollution, traffic, infrastructure, people and waste. We dived through the lens of the sea surface into the other world of colour and form, shape-shifting in the light filtering through from above, surging life in endless variety, of hidden danger and stunning beauty. Not for nothing is Raja Ampat the poster child of an underwater paradise. On the penultimate day, we would stop diving and travel to Wayag — a distant archipelago, displayed on tourist brochures and postcards, the showpiece of Raja Ampat. Its picturesque beauty embodies unreality as if such a place could exist. Wayag was more than a destination, it was a promise unfulfilled, a glimpse of an imaginary dream world. It was a state of anticipation. The day of our visit dawned on perfection with lazy swells washing onto the sandy beach, coral gardens stretched out in the bay, limestone islands motionless in a calm sea under a boundless sky, faintly brushed over with clouds and kissed by the delicate light of morning. We were on the wooden jetty, our dive boats docked nearby, taking on drums and drums of fuel. 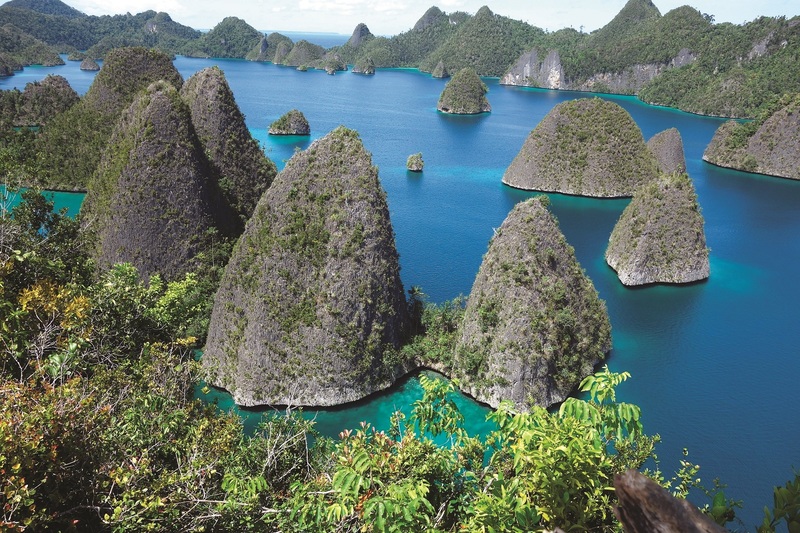 Wayag is so far that a trip there from Raja Ampat is very expensive, the equivalent of several thousand ringgit. Private yachts undertake the journey as well as some live-on-board dive boats. The distance only allows a visit and return as there is no accommodation on Wayag. The distance, one way, was over 100km, and we would leave the relative shelter of the cluster of islands for a sea crossing. The first part of the journey was in a calm vast bay connected to the open sea by a narrow passage appropriately called The Passage. 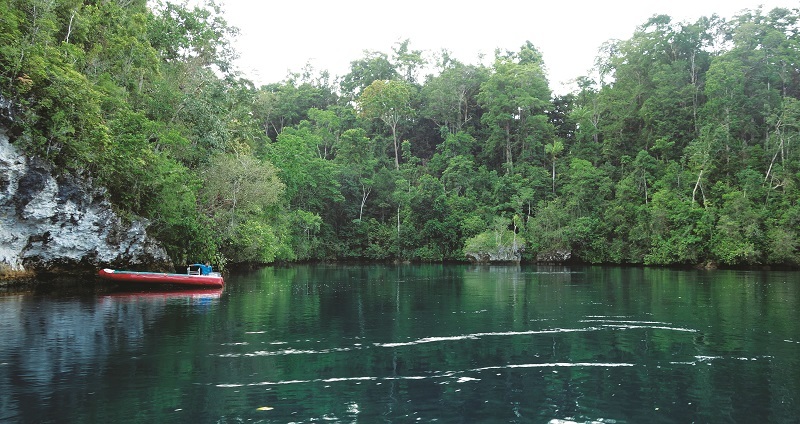 It was a narrow cleft between mangrove forests and rainforest-shaggy limestone hills. We could have been in the wilds of Borneo, on a green river with a surging current, but instead of tannin-coloured river water, this was seawater with dark patches of coral below. Aswad, the resort owner who was undertaking the journey with us, made a motion with his arms, joined at the elbows, to indicate there were saltwater crocodiles here. And indeed there should be, for it was dense, thickly forested and mysterious. The current rippled against the banks, there was the occasional fishing boat and we passed a village, raised on stilts high above the water mark, against the side of a hill cleared for cultivation. Emerging from The Passage, the island was to our right, vast, jagged in profile, forested and to all appearances uninhabited. It was a brilliant, windy day, the sea was a dark blue, and uncharacteristically choppy for the time of year. The ride was jarring, the boat plowing into one swell after another, with seawater splashing in. The boatman would ease off every now and then to spare us encountering a particularly heavy wave. After about 1½ hours, we decided we could do with a short break. To our surprise, as the boatman steered us into shallower, lighter-green water, there was a rude wooden jetty on this remote beach. 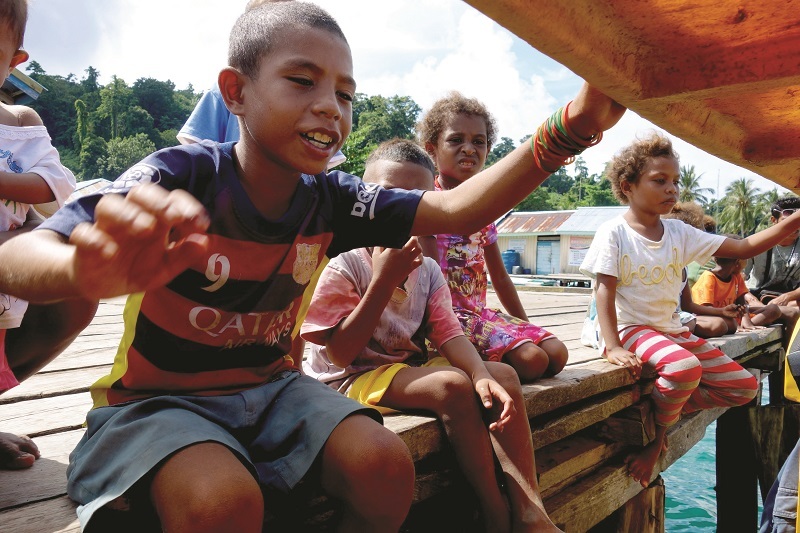 It was a small homestay, a few wooden huts with a swept-sand compound and a curly-haired Papuan caretaker. The rooms were simple but comfortable. The dense jungle rose behind, humid and turgid with life, while in front was the white sand beach and a sense of freedom that true isolation brings. Fifteen minutes later, we chugged into a sheltered bay, the sea suddenly still, karst formations arising around us. Nestled in an indent was Selpele village, where a conservation fee was required to be paid before proceeding. It was a small fishing village in a corner of paradise. While Aswad went to settle the fees, children with curly hair crowded around the boat at the jetty for biscuits and other titbits. Our journey continued, this time out to open sea, through sections dark and wave-tossed. It felt like we were heading into parts wild, unknown and unexplored, for the country was so untamed. Pillars of stone mounted by a solitary plant or two stood resolutely like sentinels, white spray exploding at their bases. There were jagged cliffs, where vegetation had gained a foothold, thriving in the isolated redoubt. Far ahead, we could see the gentle curvature of Earth, where, said the boatman, our destination lay. Slowly, over the uneven pitch of the outboard motors, our destination came into view, a distant mirage of an archipelago of cone-shaped, forested hills. Except for a ranger station, Wayag is uninhabited. Once within the archipelago, the pounding of the sea eased. It was wildly magnificent, white spray exploding against cliffs, caves formed from erosion, jagged islands rising high overhead, dripping lush vegetation, and a foamy, transparent green sea. We motored to the ranger station, a straggle of huts in the shade of trees on a spit of brilliant white sand, glad for the relief of stepping onto solid ground again. 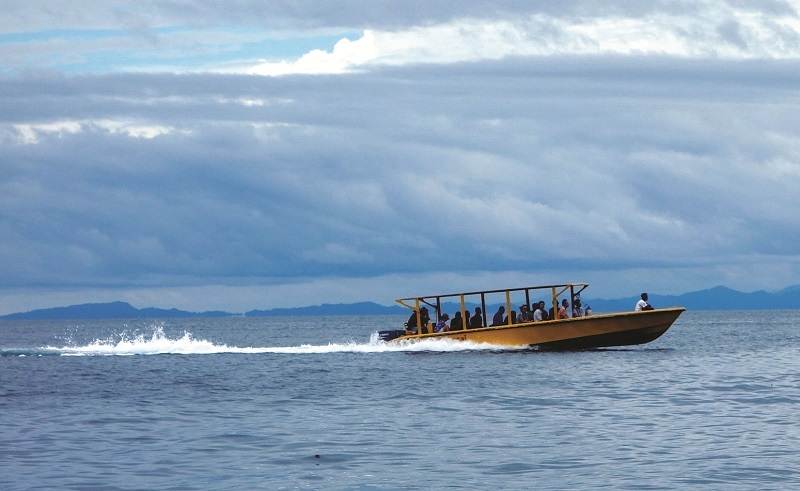 We left after several minutes of formalities, taking on a guide, a gnarly, crease-faced Papuan who sat at the front of the boat, directing the captain. Taking in the splendour of the islands, we entered a quiet, green bay. The water was shallow and calm. Around us rose cones of rock and vegetation. We had truly entered a special place. Yet the very beauty of the place disguised its hostility, for freshwater was scarce in the archipelago, although there were marine lakes within the islands. The islands rose abruptly from the shallow sea floor. We anchored beside one of them, where a weathered patch indicated a foothold and a steep climb upwards. I stepped off the boat, clung onto the limestone cliff surface and hauled myself up, becoming sweat-drenched in mere minutes. The clamber lasted only 20 minutes and then I stood at the top of the limestone hill. It was a bright, sunny day, and the stunning beauty of Wayag hit me like a blow to the face. The sight of those perfect cones of rock rising from a shallow, green-blue sea, fringed by other islands, was surreal. It was a carefully composed picture, glorious, airbrushed and colour-corrected, and it was real. I stood there soaking it in but the real world intruded: it was baking hot up on the summit and the voices behind me informed me that the others were on their way up. I paused to take some pictures, turned around and started to descend. This article first appeared on Mar 26, 2018 in The Edge Malaysia.